When she recorded these words in 1900, Ella Kostanzer became the only person to ever mention the frescoes on the dome of the Lew Wallace Study. Without her comments, lost for over fifty years and then quietly filed away and generally forgotten, this elaborate Victorian work of art designed by Lew Wallace himself, might never have been found. Imagine our surprise when a portion of it was uncovered in 2011! Researchers generally dismissed her mention of the decorative paint finishes in the Study because no one–including the Wallace family–recalled these elaborate treatments. Although Wallace’s unusual Study was widely covered in the press during construction in the 1890s, the decorative finishes were never noted. During restoration efforts in 2011, a detailed paint analysis of the interior hinted at the possibility of an elaborate paint finish. Conservators were hired to remove nine layers of over-paint to see what might survive from the 1890s. 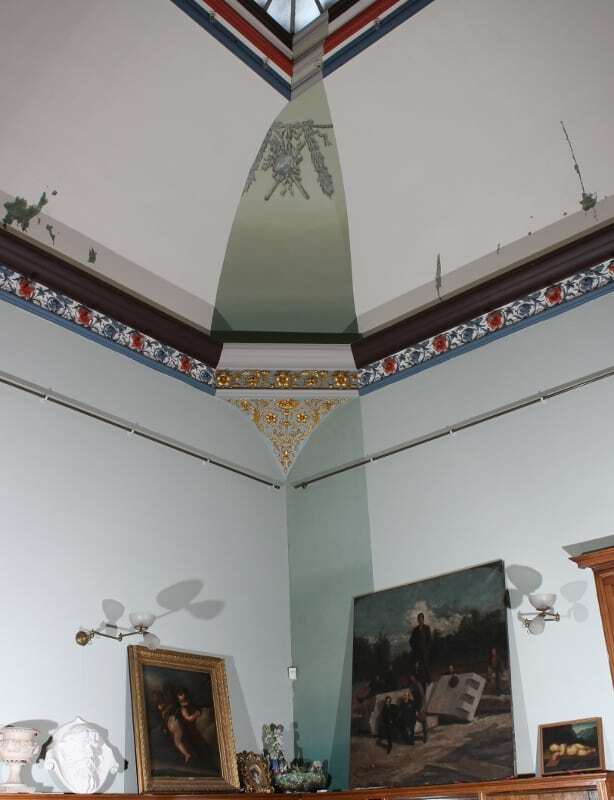 After initially failing to find the hidden artwork, conservators reexamined Ella’s written word and noted she said the artwork was “around the skylight.” They went farther up on the dome to the perimeter of the skylight and there it was! Following Ella’s description, the conservators located a fife and drum in the southeast corner of the dome and a section of the chain that will someday again link the elements of the military motif. Beyond the fresco design, the original painted finishes include an unusual color scheme that fades from dark to light blue in the main room and a dark red and gilded design in the entry vestibule. Additionally, the elaborate plaster floral band that surrounds the main room was gilded. The General Lew Wallace Study is Montgomery County’s only National Historic Landmark and the discovery of these finishes reinforces our unique status. Once restored and conserved, the Study will feature one of the most elaborate and original Victorian finishes available for public viewing in the region. Prior to the conservation and restoration effort, a serious structural issue must be addressed, as the wiring in the building is suspected to date to the 1890s. This wiring must be removed and replaced–a delicate operation. This project also includes the installation of a modern security system. The cost of the electrical work, paint conservation, and attendant services is estimated to be $300,000. Dedicated to the preservation of regionally and nationally significant historic buildings, the Jeffris Family Foundation of Wisconsin has granted about $1 million annually since 1979. The foundation has recognized the significance of the original paint finishes. The Jeffris Family Foundation has issued a challenge grant of $100,000 to the General Lew Wallace Study & Museum. We must raise $200,000 to meet their challenge. While the board and staff are committed to raising a significant portion of the $200,000 through grants, we are seeking at least 100 individuals who will pledge to give at least $1,000 each over the next two years. As of July 2014, we have reached our goal and are moving forward with the project. While the electricians are working inside the Study, we must be closed to the public. We are currently planning to close the interior of the Study building on or after November 1, 2014. If you are planning a visit to the Study after November 1, please call ahead. Our exhibit and grounds will remain open until December 13, 2014. THANK YOU FOR HELPING US MAKE A HISTORIC DIFFERENCE!